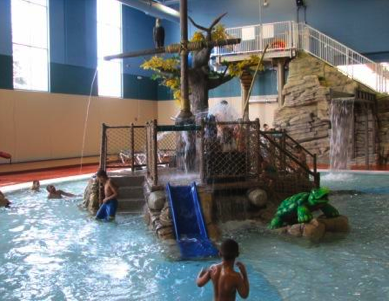 A few years back, I spent many-a-winter Mondays at the Oxford Community Center Great River Water Park with my little dude and his pals. It was always great fun but more importantly, it was warm. And it was winter. In Minnesota. The Kids’ Pool is perfect for smaller swimmers. There’s a little water slide, a rope climb area and some squirty toys (beware of spitting turtles!). The lifeguards were super vigilant and I always felt that my clumsy swimmer was safe even if I wasn’t in the pool. The admission fee ($4.50 for those under 48″; $5.50 for youth ages 16 and under; $6.50 for adult) is pretty fair and you can just pay a $2 if you’d rather plant yourself on a deck chair than swim. We’d meet our friends at 4 pm on a Monday (Mondays and Wednesdays are half price! ), swim for a few hours, shower up for the night and be back home for dinner. Bing, bang, boom!